Black Butler: Book of the Atlantic is a 2017 Japanese animated film based on the Black Butler manga series written and illustrated by Yana Toboso. The film was premiered in Japan on January 21, 2017. 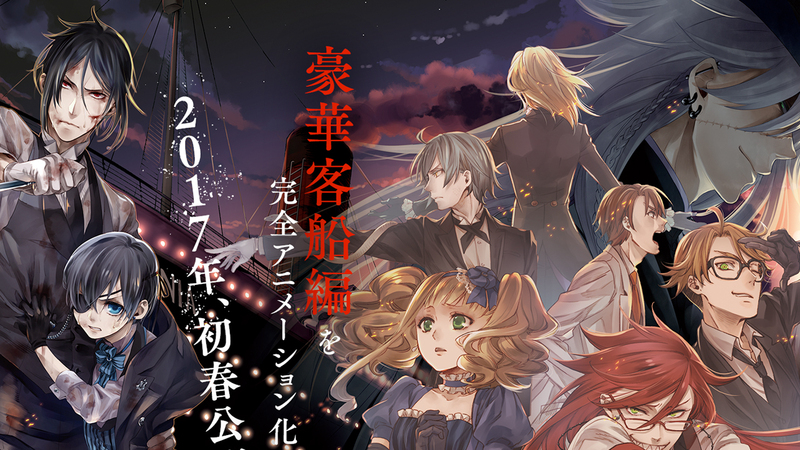 The film will adapt the sixth arc, Luxury Liner, of the Kuroshitsuji manga independent books – the arc comprises the 11th, 12th, 13th, and 14th volumes of the source. The story is set on the luxury liner Campania and centers around secrets to resurrecting the dead. The manga already inspired three television anime series and three original video anime ( OVA ) projects. The most recent OVA series, Black Butler: Book of Murder , premiered in two parts in Japanese theaters in 2014, respectively. In a manor house on the outskirts of Victorian era London, butler Sebastian Michaelis serves Ciel Phantomhive, the head of an English noble family as well as a toy, food, and candy empire, Funtom Corporation. Sebastian obliges to any task required by his master and solves the problems plaguing England effortlessly due to his demonic lineage and Faustian contract with his master. In April 1889, Earl Ciel Phantomhive and his servants, Sebastian Michaelis and Snake, board the luxury passenger ship Campania alongside the Midford family—not for recreational purposes, however, but for investigating illegal human experimentation, which is later demonstrated at an Aurora Society meeting headed by a questionable doctor. Deceased individuals are coming back to life, but they have changed into something other than human. What is reviving the dead—a breakthrough in medicine or an unforeseen force?